Hortus Camdenensis | Ixia longituba N.E.Br. A cormous perennial with 5-6 linear, lance-shaped leaves, often spirally twisted, and flowering stems to 75cm, sometimes branched, bearing small pale to deep pink, sometimes white flowers, darker on the outside, in spring and summer. [RHSD, CECB]. ‘Found by Thunberg, at the Cape, growing in moist sandy places. Is very impatient of drought, and should be set in a pan of water when near flowering. Varies with white, pale pink and purple-rose colour.’ But see notes. [BM t.589/1802]. 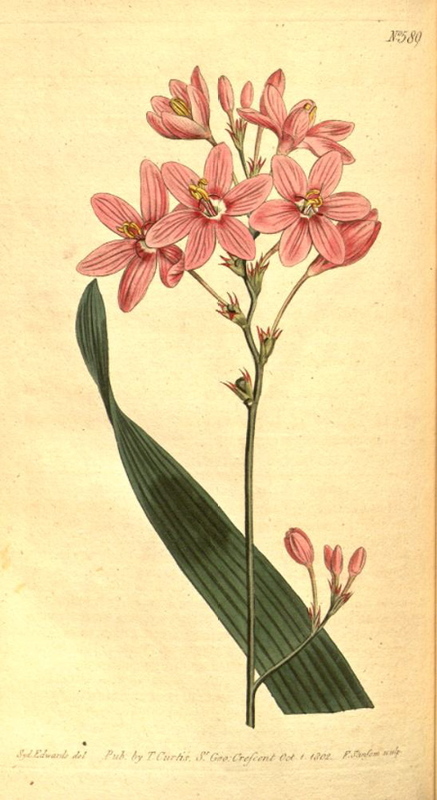 Andrews' Botanical Repository figures Ixia aristata atropurpurea, introduced to Britain via Holland c.1795. [ABR pl.87/1800]. Ixia aristata was introduced to Britain in 1800. [JD]. Listed in the 1845, 1850 and 1857 catalogues [B.267/1845]. In Macarthur’s possession by 1843 as specimens were sent to William Macleay in that year. [MP A2948-3]. The specific identification of a number of Ixias is uncertain. Ixia aristata is quite typical. John Gawler comments in the Curtis’s Botanical Magazine article quoted: ‘The specific name [Ixia aristata] was undoubtedly suggested to Thunberg by the spathes, which however he describes as “aristato-dentatae”; and we guess that the inappropriate application of the word “aristata” was in some measure the cause of the mistake in Hort. Kew. where Sparaxis grandiflora (Ixia grandiflora Bot. Mag. No. 541, and Ixia bulbifera, var. purpurea Thunb.) is taken for the present species.’ Ixia aristata Ker-Gawl. is often taken to be Ixia campanulata Houtt. but it seems to me to bear a closer resemblance to Ixia longituba N.E.Br. as stated here. As all of the probable alternative identifactions were undoubtedly represented in the Camden Park gardens precise identification is probably not important. Ixia aristata Thunb. (1789) = Sparaxis grandiflora (de la R.) Ker-Gawl. which see. Ixia aristata Schneev. (1794) = Ixia patens Ait. which see. Ixia aristata Ait. = Ixia campanulata Houtt. which see.